It was a relatively normal Tuesday morning at my house. I had been doing all of my morning chores. I made a double batch of my allergy friendly muffins for my boys for breakfast. While I waited for those to bake, I headed to my desk to get a few quick things done for clients before the boys got up. I completed a few things, pulled the muffins out of the oven, and found a gaggle of boys on my heels ready to eat. While they finished up breakfast, I got things ready to start school and jumped online to quickly check Facebook. I saw a post from a client and blogging friend about losing a blogging friend. My first thoughts were of sadness for her and wondered who it was. Then I saw the name and I saw my Facebook feed filled with posts about this friend. And then world felt like it crashed. Hours earlier, in the middle of the night, a fire had broken out in the home of Mandy Kelly. Mandy, her husband, and two of their children passed away in the fire. Their two older children and her mother-in-law survived the fire. I've known Mandy for several years, but I never had the chance to meet her in person. 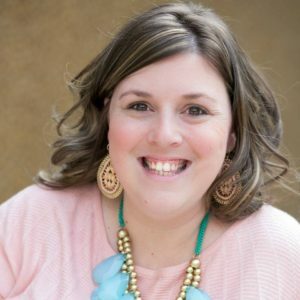 Mandy wrote for Kids in the Word and those posts now live here at The Pelsers. She and I were as a part of a small group in an online course we were taking when she passed. I was nowhere near as close to Mandy as some of the ladies in our circles, but I found myself overcome with grief and even some anger. I felt like I was in a fog much of that day and struggled to focus much of the week. I know Mandy well enough to know that she wouldn't want me to cry over her. She is now in the place her spirit has always longed to be: in the presence of her God and Savior. You see Mandy lived with joy. She fully embraced life. But, life to Mandy wasn't about this earthly existence. Life is about eternity with Jesus and inviting as many people as possible to join us there. Her last published post on March 19, 2017 was about seeing Jesus for who He really is. Her last published words before leaving this physical world pointed readers to discover who Jesus is so we can also see who we really are – and how much we need Him. Mandy finished well as she so desired and communicated in this Facebook live video. I encourage you to take the time to watch it. So, what did I learn from Mandy? 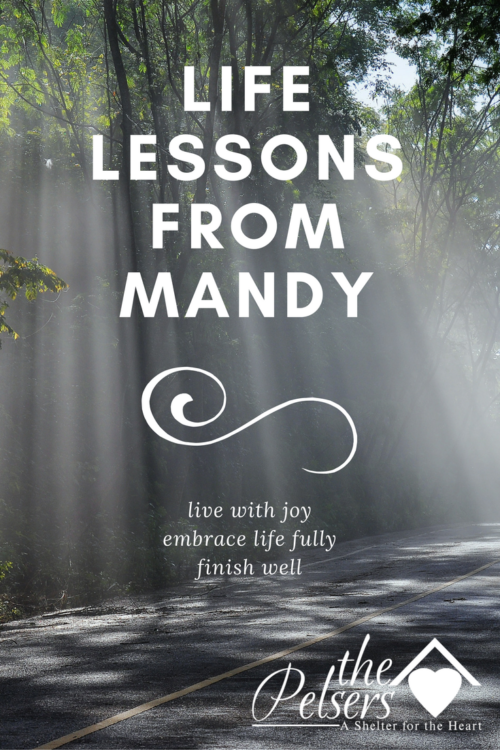 Mandy's life has encouraged me to live with joy, embrace life fully, and finish well. What do we do now? We focus on the life lessons we learned from Mandy and we care for those left behind. We can do that through prayer and support. Please pray for the two children who survived the fire. I think that's where Mandy would want us to focus too. She, Scott, Lizzie, and Baby Judah are home with Jesus, but Bekah and Jared are still here with us. Bekah and Jared had already lost their mom years ago and now they've lost their dad, second mom, and two siblings. These kids have now gone through a second catastrophic loss at a young age. I've been a kid left behind so I know some of their pain. (My mom died when I was only 13 years old. As I write this, I'm actually almost the age she was when she passed.) Pray also for the extended family as they grieve and take care of Bekah and Jared. Another thing we can do is to take care of Bekah and Jared's physical needs. If you would like to help the surviving children of Scott and Mandy, donations are being accepted by their church here. Checks should have Kelly Fund written on the memo line. For online donations, click the give button and choose Kelly Fund from the drop down. The final thing we can do: Point to Jesus in everything we say and do. Learn from Mandy's example and finish well. We are not guaranteed tomorrow, so love God and love others today! Thank you for the gentle reminder that Mandy would want us to focus on those who remain. I have struggled over the last week to keep my focus where it mattered. <3 I needed this. I felt the same way last Tuesday. It was so hard to concentrate and all these blog tributes are soothing to my heart. Love her legacy!